Over the years, I’ve written lots of fictional weddings. But around here, I’m excited about a real one coming up. Let me backtrack. I’m an only child and it never bothered me. I had close cousins and lots of friends. But when my older cousin became an aunt when I was 13, it hit me that I’d never be an aunt. My mom said if I married someone with siblings, I might get the chance at nieces and/or nephews. But I said it wouldn’t be the same. Then this really cute guy came to my school and when I saw him walking across the campus, I decided I was going to marry him. Six months passed and he never noticed I was alive. Back then, I was painfully shy and didn’t know it until later, but everyone thought I was stuck up because I didn’t talk to anyone. He says he noticed me, but thought I was out of his league. I thought the opposite. I mean, look at him. This picture was taken on a day that changed my life. Sorry it’s blurry, but it’s a picture of a picture since we didn’t have digital back then. It was Fall Festival night in the gym at our school. The really cute guy was voted to represent our class in the pageant. I mean, of course he was. Just look at him. 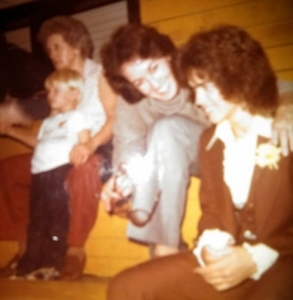 That’s him, his mom, and grandmother. And the little guy, that’s Jason. My life changed that night because I was wearing dress pants and heels. Honestly, it was hard to traverse those slick bleachers safely in heels. Though I had done it thousands of times, that night, I got the nerve to use his shoulder as a prop when I stepped down a level. Right there next to his mom. I still can’t believe I did it. And it worked, he noticed me. A few weeks later, we were going together, even though we didn’t actually go anywhere since I was only 14 and my parents wouldn’t let me date yet. But we were a couple all through high school and married a year after graduation. I got Jason, his nephew, in the package, loved him from day one. And realized that a nephew by marriage was just as good as by blood. Jason grew up. Even though he was raised in church, he got in a bad crowd. At one point during his last years of high school, we tried to get him to move in with us. He didn’t because he knew we’d have rules. He managed to graduate and get a job. But by the time he was nearing thirty, he was divorced with a son, jobless, and living with relatives. For a long time, we didn’t know what the problem was. We thought he was just lazy. His personality changed. Gone was the fun-loving guy with the great sense of humor. In his place, a stranger with stringy hair and a bad temper. Family members thought he was bipolar. We suspected drugs. Since we had a young impressionable son who thought Jason was cool, we had to cut him out of our lives. Tough love is hard, but we didn’t want to enable him. For ten years, we lost Jason. We prayed and worried we’d get a phone call that he was dead. About three years ago, he got busted. Felony charges lurked. While he was in jail, a high school friend of his involved in a local jail ministry, visited and shared his testimony. Jason rededicated his life to Jesus. He got out on probation, but he had to go to church and have the preacher sign a form saying he came at least once a week. He came three times a week. He had to take bi-weekly drug tests and go through a drug counseling program. And he had to get a job. We were skeptical at first, afraid to trust that the change in him was real. But over time, we couldn’t deny that Jason was back. And on fire for Jesus. He got a job, got his own place, repaired his relationship with his son, and found a wonderful Christian girlfriend. Over the last two and a half years, we’ve gotten to share holiday gatherings, birthday celebrations, and life in general with him. 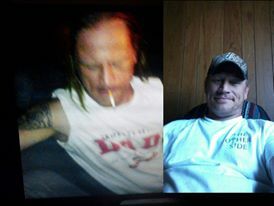 The split picture above is a self-portrait he did of himself showing the difference drugs and clean has made in him. He finished his probation and his last drug test was over a year ago. I’ll admit, I was kind of afraid he might get more lax on his church attendance. But he hasn’t. He still attends three times a week, teaches teen Sunday school class, works in the jail ministry, and is involved in a men’s Bible study consisting mostly of former addicts. 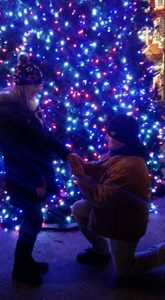 He proposed to his wonderful girlfriend last Christmas. So it’s celebration time around here with the wedding a week away. We have family coming from Texas on Thursday and staying with us. My house is in a state of preparation for company and lots of family gatherings with meals before the wedding, decorating the church, and celebrating the happy couple. This wedding was a long time coming. It took lots of tears, worry, prayers, and heartbreak to get here. I’ll admit during his drug years, I gave up on Jason. But not on God. So if you have a family member lost to drugs, don’t give up, keep praying. God is bigger than drugs. And here’s the proof. This is their soon to be blended happy family at our house last Christmas, shortly after the proposal. 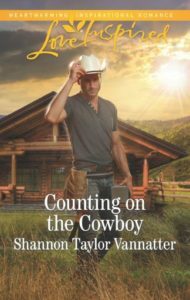 Since I often incorporate things that happen in my real life into my books, of course the family member on drug theme wound itself into my latest book, Counting on the Cowboy. So, let’s talk weddings and blessings. Any real life weddings coming up that you’re excited about? Has God restored a family member or loved one to you lately? Any blessings you want to share? 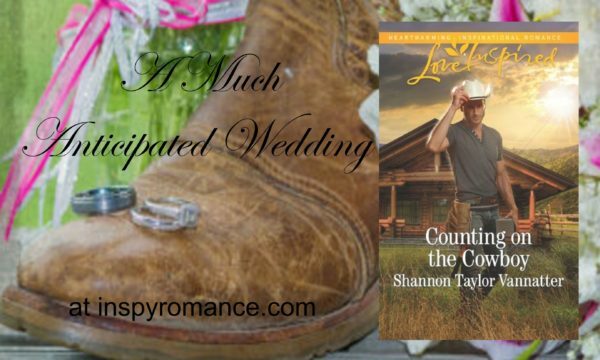 Comments will go in the drawing for a copy of Counting on the Cowboy. I am so happy to read this real life recovery of your nephew!! Prayers that he continues on this amazing path. My son is a drug addict and has been in jail more than out over the last 12 years (he just turned 32) I pray constantly that he will turn that corner like Jason has! I feel your pain, Paula. Just keep praying. At times, I’d given up on Jason and simply went through the motions of praying because I hadn’t given up on God. No dramatic restorations here but I loved reading the story of your nephew. A true inspiration. It’s been really awesome to have him back in the fold. And to see our teen son have a relationship with him tops the cake. Love to hear testimonies of restoration. He does have a great testimony. And a great preventative story too. My 16 year old son told me several months ago that I didn’t have to worry, that he would never do drugs. I asked why he was so sure. He said because he saw what it did to Jason. Hi Shannon! Thanks for sharing your nephew’s heart wrenching story with its positive outcome. Unfortunately several of my retired friends weren’t as fortunate and are now raising their grandkids. Our family will be attending several weddings today. Wished we had better weather, because it has been thundering all morning. My middle son and his wife are attending a wedding in SE Michigan. My husband is officiating a high school friend’s second wedding in the chapel he often visited as a child. His grandmother was the church’s organist. About a decade ago this chapel was moved to the Historic Charlton Park which houses other historical buildings and steam tractors. Best wishes to you and your extended family. Enjoy your day and the blessings of recovery. Happy Mother’s Day. Enjoy your weekend. Yes, two of our church members had grown children die due to drugs while Jason was lost to us. I was so afraid we’d get a call like that too and so thankful we didn’t. I guess it’s the season for weddings. That’s really cool about the chapel. I have been to Charlton Park!!!! That is a great historical village! I grew up in Vermontville, have lived in Nashville and have worked in Hastings! What wonderful grace from our Lord! My sister struggled with mental illness and attempted suicide until diagnosed with BPD. She has since turned back to the Lord and realized her mental defect requires medication. This was hard for me to accept for a while, but I have seen her grow in the Lord more than ever. BPD is a terrible thing. It’s amazing how the symptoms can mirror that of drugs. I’m so glad your sister is taking her medication and y’all can have a relationship. It’s been such a blessing to enjoy the last three years with Jason. I often get teary whenever we share something new with him. First time he prayed out loud in church, first time he taught Sunday school, first time we got to go to the movie theater with him, first time he came for Thanksgiving and Christmas. The list goes on. He probably thinks I’m his silly old blubbering aunt. Wow thank you for sharing about your nephew. What an amazing story about how God works in our lives. We have a loved one going through addiction. The paths they have followed are very similar. I guess there are few live addiction hasn’t touched in this day and age. Praying for your family member and your health Cheryl. And thanks for the compliment. Oh wow! Repentance and restoration never looked so sweet! Both very good reasons to celebrate. Beautiful story, thank you for sharing it. Thanks to God, Jason has a sweet spirit again. And being able to spend time with him is really sweet. What a story….you and your hub did the right thing. So happy that now things look so good for Jason! Blessings on you all!! Thanks Jackie. Tough love is hard to stick to sometimes. Really hard. But I’m so thankful we don’t have to do that anymore. My blessings is my hubby went back to work after being laid off all winter. That’s wonderful, Lucy. Layoffs are hard when the bills keep coming. One of the deacons at our church has a daughter getting married in July. We are very close to this family, so we are looking forward to that union. Thank you for sharing your nephew’s testimony. It gives me hope for some of my wayward loved ones. I love weddings. I can’t wait to decorate for ours. I did the floral bouquets and swags for the arbor. It was a lot of fun and they’re silk, so she can keep them. I’m just glad it happy ending. yes, all three of my adult children. Father showed me in a vision several years ago and i’m watching it manifest. my oldest is 39 and has been drinking “over half his life” (his own words.) he has been sober now for over a year, and just started a great new job. son #2 – Father didn’t show me how in my vision, but he is restored to me too (speaking still by faith.) he hasn’t had the drinking issue / addiction my oldest has, but so many things have crushed my family and he essentially cut me off a while back. and my word for 2018 is RESTORATION and it is amazing to watch as Father restores one thing after another!! That’s awesome Robin. Sounds like you have a great testimony too. Lord bless! Thanks for the encouraging testimony. We’re blessed our youngest grand daughter is being dedicated to the Lord tomorrow. That is a blessing, Diana. And on Mother’s Day. So happy for Jason. Only God could make a change in him. God is Good. Yes. Only God. It’s been really amazing to see the difference in him and watch him grow as a Christian. I enjoyed reading your blog. God never gives up on us.. no matter what we face and the trials we go through. Your book looks like a great read and would love to be entered to win a copy. I am amazed at how God changed Jason.. what a praise report. So true Andrea. Jason is a walking testimony. Best wishes to the bride and groom. So glad Jason came back to God. God is good! 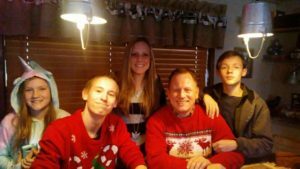 I’m so thankful that drug use has not touched our family thus far. Congratulations to the whole family! You are blessed Patty. The more I talk about it, I’ve realized how few families there are who haven’t been affected by drugs.